Evidence points to the fact that house dust mites once belonged to a family of mange-like parasites that thrived on the skin of warm-blooded animals. At some stage during evolution they changed to become free-living scavengers, residing in warm, damp and dark nest sites, eating decaying organic matter such as discarded skin scales. The change was beneficial for the mite because it no longer depended upon the life of its host for its existence, and could use its former disease causing enzymes to break down food. It is these enzymes that are now blamed for causing allergic asthma, rhinitis and dermatitis. Image courtesy of The London School of Hygiene & Tropical Medicine. In making the changeover some of the mite's parasitic characteristics remained and became enhanced to deal with the new way of living. These characteristics include the mite's ability to make specialised enzymes that dissolve the 'glue' that binds defence cells together and others that break down discarded cuticles such as shells from dead animals or human nail clippings. It is these enzymes, plus others, help make up the 14 allergens found in house dust mite droppings, which can cause asthma, rhinitis, eczema, and conjunctivitis. 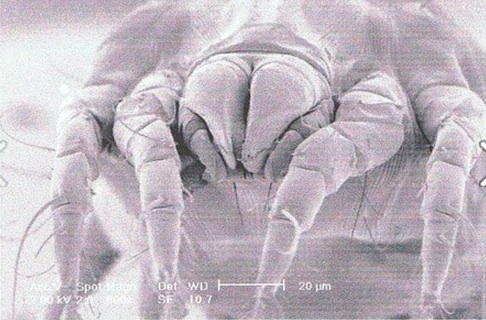 By looking in depth at just one of the enzymes, the destructive power of the mite becomes apparent, along with its ability to harm beyond allergy. Group one allergen (Der p1) is a digestive enzyme, similar to one used in the food industry (papain). Der p1's activity has been shown to dissolve proteins that bind defence cells together. Once in the body it continues its disruptive pathway by clipping immune molecules known to signal allergy. But perhaps it is at its most harmful state when the activity of Der p1 offers bystanders or opportunistic pathogens an entrance into the body. The fact that the mite morphed from parasite to scavenger could change the public's perception of the mite from being a nuisance to a dangerous intruder in our homes threatening the health of the vulnerable, most of whom are mite allergic children. Allergens and their role in the allergic immune response', TAE Platts-Mills, JA Woodfolk, 'Immunological Reviews', 2011, Vol: 242; p 51-68.